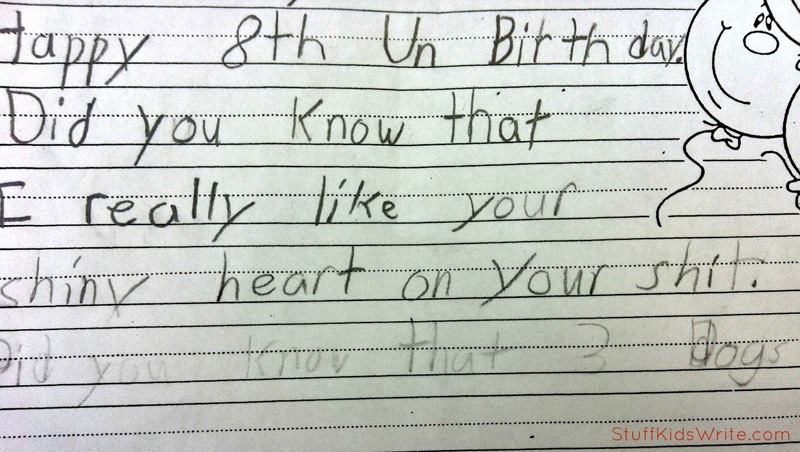 At one elemantary school, second graders have to write birthday letters to their classmates. If a birthday falls on a weekend or holiday, students celebrate their un-birthday. Posted on June 12, 2012, in School Assignments. Bookmark the permalink. 7 Comments. Where do you get all this stuff? How can you be funny ALL the time? Ha! At first I thought the last line said, “Did you know that?”, which also made me laugh. I really want to know about the 3 dogs too. Ha! I student taught in a 2nd grade classroom and we wrote birthday letters too. I should have documented all of the funny stuff that came out of their mouth. Reblogged this on In a Nutshell.